I wrote about stumbling upon the ‘related to..’ results in Google Adwords last Friday here. Since the chances of Google giving an answer to me were slim at best, I did my own research into the matter and here’s what I found out. The earliest reference to this phenomenon I found was from June 21st last year. 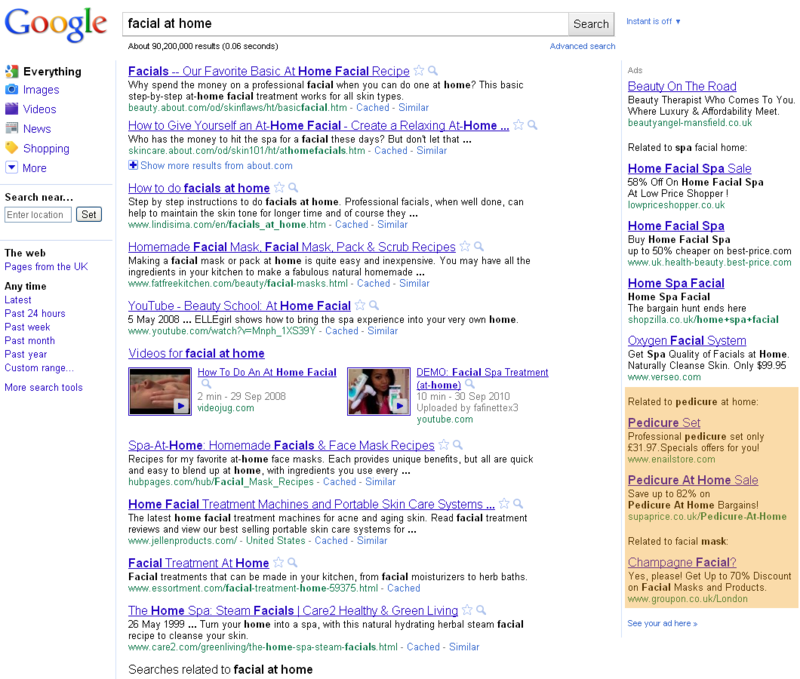 The Search Agency’s blog reported about seeing the ‘Related to …’ results on several queries, like ‘facial at home’ and ‘dodgers’, both of which still do serve up the related ads. Facial? Why not get a pedicure instead? The story doesn’t end there though. I did some digging of my own and found a page in the vast plains of Adwords Help. Which ads are eligible to appear under search ad refinements? All ads in English targeted to the US using broad matched keywords are eligible to appear under these search refinements. Related ads will only appear for broad-matched triggered ads where relevant based on common subsequent searches that users make after their initial query. What is the pricing for related search ads? Clicks received for these ads are the same as clicks on any AdWords ad. You will be charged according to the standard CPC auction model if a user clicks on one of your ads. So there you have it- another reason to go for phrase and exact matches on Adwords or have large lists of negative words. Also it’s probably a good idea to spend that little extra time on making sure you’ve covered all possible venues that your ad might go to the wrong searcher – no use for a moving company paying for confused people searching for ‘hair removal’, eh?